The “Allii Brothers Marlin Hui” is alive and strong and living right! Today, Buzz Colton and his brother Father Gary Colton fished an action filled day aboard Fire Hatt. They are both avid fishermen and purchased this trip through a donation we made to the IGFA Foundations Silent Auction. Buzz has snagged this trip several times over the years. We thank him for supporting the IGFA (International Game Fish Association) . Using light tackle (for here) Two Shimano 50’s and two Shimano 80’s were their choice. The day started with a nice rip on the stinger, we are Hooked Up! Buzz was in the chair and after a few minutes the fish came undone. A short time later, the long corner was hit and this time Father Gary is in the chair. Father Gary successfully brings a nice Striped Marlin to the boat and the Crew on Fire Hatt released the fish. And then not to be undone, we have another bite, Buzz is back in the chair and the fish again comes undone! We had one more mystery bite to complete the day. I think God has a favorite here! 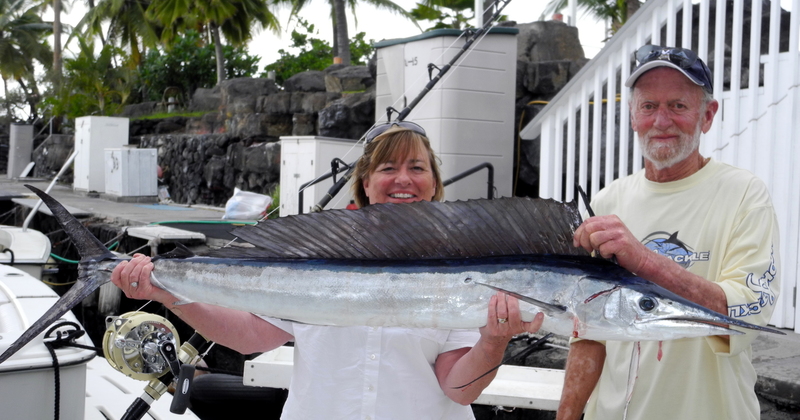 Buzz and Father Gary have been fishing waters of Kona, Hawaii for over 50 years. They have fished numerous Tournaments, won their share of trophies and have stories of a lifetime. We are proud to call them friends. 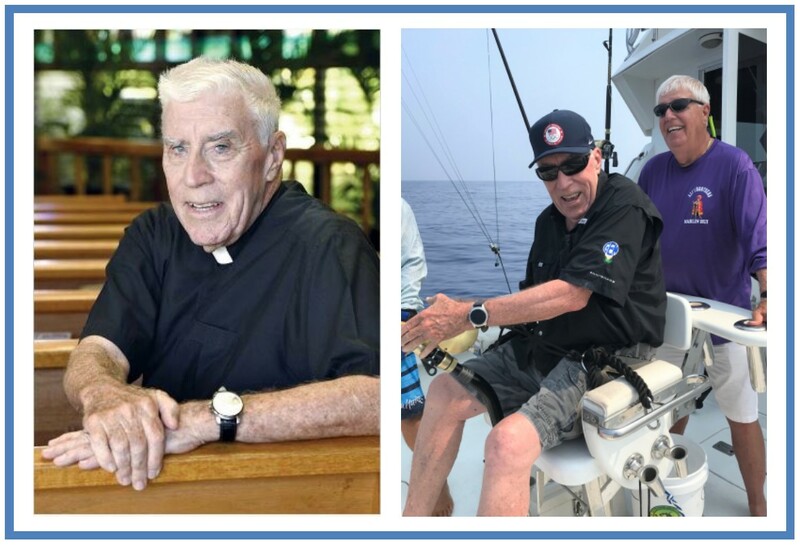 Born in Van Nuys, Calif., Father Colton and his family moved to Maui in the early 1950s because his father, a dentist, loved Hawaii and wanted his family to live in the islands. Later, the family moved to Oahu for the elder Colton to set up a private dental practice in Waikiki. On Friday, June 2nd , 50 years to the day, St. Theresa Church in Kihei hosted an anniversary celebration with Colton serving as the main celebrant during Mass. Father Gary continues to serve as a chaplain for the Maui Police Department. He’s a member of the advisory board for Catholic Charities Hawaii, Maui; a member of the Diocesan Board of Education for Hawaii Catholic Schools; and he’s one of the founding members and an ongoing member of the board of directors for Ka Hale A Ke Ola Homeless Resources Centers. Fire Hatt is a proud member of the AFTCO Pro Fishing Team. You can go to AFTCO.com and read their amazing story.